As an agriculture engineer and an environmental economist I can easily attest that Blue Gold does not imply privatization under any shape or form, it seeks to emancipate citizens in their contribution to the decision making, including other stakeholders such as NGOs, as opposed to being passive members of a badly mismanaged opportunity. Blue Gold’s desire to privatize is not a private matter. They state so quite clearly in their own booklet. Also see the figure on page 76 of the Blue Gold booklet. “He who says it cannot be done should not stand in the way of he who is doing it ” – Chinese Proverb. Rania, where do I start? 1-water and the nation. For 67 years , the governments of Lebanon were unable to fix the water infrastructure in Lebanon. Be aware that until today we use only 17 % of our water. Israel uses 107% of it. Water has become the most strategic element of the regional geopolitic paradigms. The reason for it is the incapacity of our ministers to agree on an integrated water plan for the nation. Tell me Rania, what do we do? We let go? Or do we try to fix it? 2- the role of the citizen . We believe that if the politicians cannot do it, maybe the civil society can propose a water plan that make sense. this is exactly what CIH civic Influence Hub has done-the hard way- not through demagogic blogging but the professional way of gathering citizens ready to sacrifice time and some funds to finance an integrated water plan with the participation of 30 lebanese water experts, 20 NGo’s volunteers, and more then 300 citizens joining forces to gather data, do field work, write, illustrate, edit the most comprehensive integrated water plan ever done in lebanon: BlueGold 5 year plan. We called it bluegold because if bountiful, water can be gold in value and if scarce in times of global warming and drought , it is rare and valuable as gold. so gold terminology is not about greed but value. gold is in the eye of the experts, citizens, and volunteeers who contributed to the initiative. 3-the truth about the plan. As a scientist who read the plan , I suppose that you understood its core mecanism. INTEGRATION of all the water paradigms in one plan . IE : less dams, generalization of drop irrigation, forestation, recycling , harvesting, grey water network in parallel to fresh water, fresh water springs under the sea, water quality and water purification, 40 initiatives on 20 years and 14 immediately to create a strategic water reserve for days of drought, for bringing the water bill down to the people, for getting 24h water a day, for exchange of water v/s food to reduce the food bill of the nation and create a sustainable calory/citizen equation that make sense. Of course, you read maybe about all this but maybe you didnot find any sensationalism in talking about the value of the plan. You stick to the big privatization word. so let’s talk about privatization, Not according to world bank and the many researches done and submitted by you but according to the BlueGold. 7-Common sense. 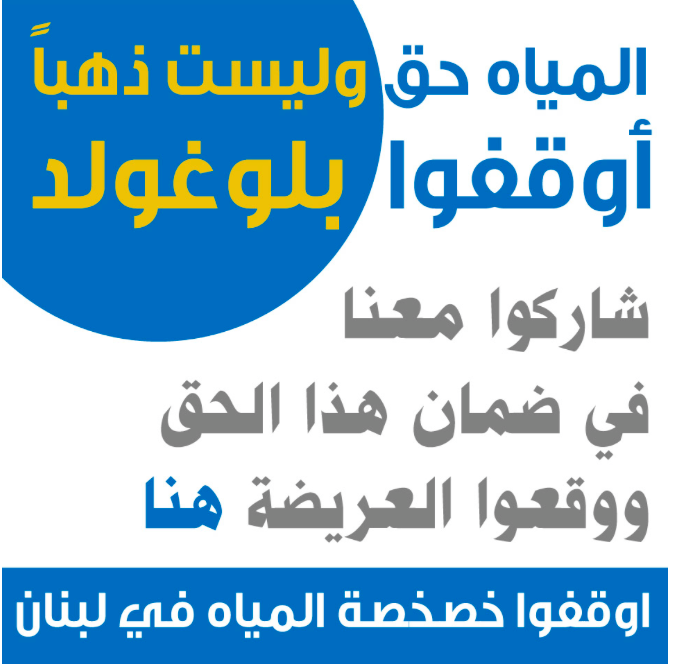 Do you have a better idea then asking for a petition to destroy a sound initiative that can save the water of lebanon? do you give yourself a chance to dig into the plan and eventually being a scientist to improve on it? do you want to create a nuclear weapon, or do you prefer to build a nuclear power station ? more useful to mankind? 8- your supporters. Have the courage -by honesty to your supporters- to present all the aspects of the plan with full integrity and then ask them if they still want to vote against it? 9- Scientific debate . Face the CIH experts and bring with you your closest supporters and transform partiality in an open constructive debate, THEN procede with your petition if you still want it, at least you will not be accused of demagogy and obscurantism. AS far as CIH is concerned, BLueGOLd is designed by the lebanese people to the lebanese people, we have only one leader to guide us, THE IDEA THAT WE CANNOT CARRY ON LOSING OUR WATER IN THE SEA. Is it what you want? 10- Our supporters. BlueGold is already supported until today april 25, 2014 by 60000 voters on internet and sms and 52000 facebook supporters 112000 in all. are they all ignorant about the realities of the plan? do you know more then them ? did you do more homework than compiling irrelevant studies to the specific , complicated lebanese water problem?